Clichés of course become clichés because they are true: so 'Travel broadens the mind' while trite, is incontrovertible. More than that, though - if less snappily - it also deepens your understanding and adds to your general knowledge. That's one of the happiest side-effects of travel writing, that meeting enthusiasts (enthusiasm is a basic requirement for travel industry operators, I'm very glad to report) introduces you to topics you've missed, and inspires you with the desire to find out more about them. Today, writing about meeting the lovely Nigel and Rose Voice of Real Dog whose passion is sledding with their Alaskan Malamute dogs (they spit upon your Siberian Huskies - "out of control all the time, aloof, disobedient - disgusting!") I've gone off onto a tangent finding out about Douglas Mawson. One of the dogs is named after him, and Nigel played him for the action scenes of a documentary. He had to wear a false beard: "How do people eat with those things?" 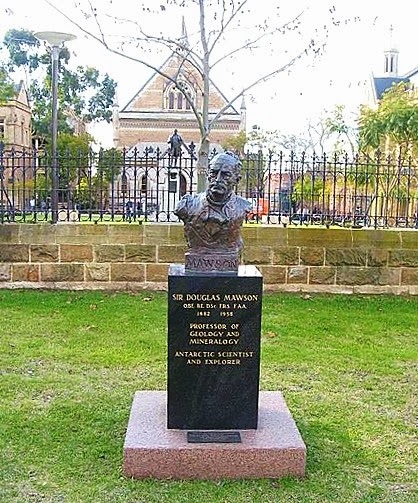 Born in England, Mawson went to Australia as a child and there's a bust to him on Adelaide's North Terrace, a stately avenue I've walked along a number of times, looking at the plaques and statues. I'm sorry to have missed Mawson. I'll have to look out for him next time.